The world of burgeoning small businesses in the U.S. may never have been stronger than at this moment. Technology has helped push through a sea-change of opportunity where any strong business concept might be the next powerhouse franchise. It could be a mobile app-based delivery service or maybe it’s car detailing. Or even pet costume shops. Social media is playing a large part in helping these business concepts get off the ground and into key markets. All of the interest generated in expanding a particular brand’s goods or services also coalesces into consideration of expanding as a franchised business. 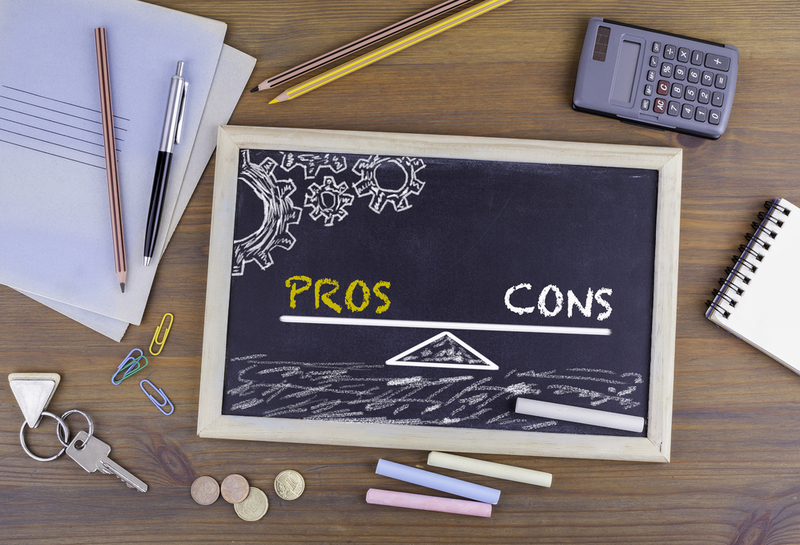 During this week’s Proven Match blog, we’re going to take a look at some of the most common pros and cons of franchising a business concept of your own. At a minimum, we’ll help raise the questions you should be considering if you’re interested in franchising your brand. In order to really get the conversation going, let’s tackle the cons first. As in, you can’t be serious right? Yes, taking an independent, strong-performing business concept to a franchised opportunity can get pricey. It’s a very big step designed to help your brand spread like wildfire and the process doesn’t necessarily come cheap. While you may have a strong financial standing, the process of franchising your concept will take time, resources, effort and a good measure of capital. While you may be used to calling the shots, once you begin franchising your concept and recruiting new franchisees into your system, you won’t necessarily have direct control over their day-to-day operations. Those will be laid out in the franchising agreement. If you’re a control freak, franchising your business may not be for you. If you’re thinking of franchising your business concept, your very role in the company may change drastically. While technically it should be considered a promotion, you’ll now be the cheerleader-in-chief, rustling up interest in your business brand for prospective owners. If you have no worlds left to conquer in your current acumen, go for it. If not, reconsider how happy you’ll be with a transitioning role. Franchising your business could mean that the brand you began will become a thing. A big thing. And your name, your process and your success will be stamped all over it. A successful business that transitions into a successful franchise concept is the kind of move that gets you in the pages of Forbes Magazine. Are you ready for that level of success and attention? When you decide to franchise your business, your new franchisees will be fronting the capital necessary to set up shop. Rather than you expanding locations and territories on your own dime, the incoming owners will put up the funds necessary to license your business concept. And you’ll even get royalty checks, which is the very definition of recurring income. When you decide to franchise your already successful business operation, you remove the need to fund your own expansion. In a nutshell, this means that your ability to scale your business into new markets is now dependent on attracting new owners while helping them to succeed. And it shouldn’t be a stretch to assume that the new franchisees will be committed to succeed in promoting your brand. After all, they’re fully vested in the concept, just like you. Deciding whether or not to franchise your business is a proposition which shouldn’t be taken lightly. We always counsel careful consideration and due diligence. Get out there and talk to people whose opinion truly matters. Don’t just go to the Yes Men. Seek both sides of the argument. You didn’t get where you are today by listening to obvious bias. Because if franchising your business concept is truly the route you want to go, you’ll need to consider both the pros and cons of this exciting proposition.